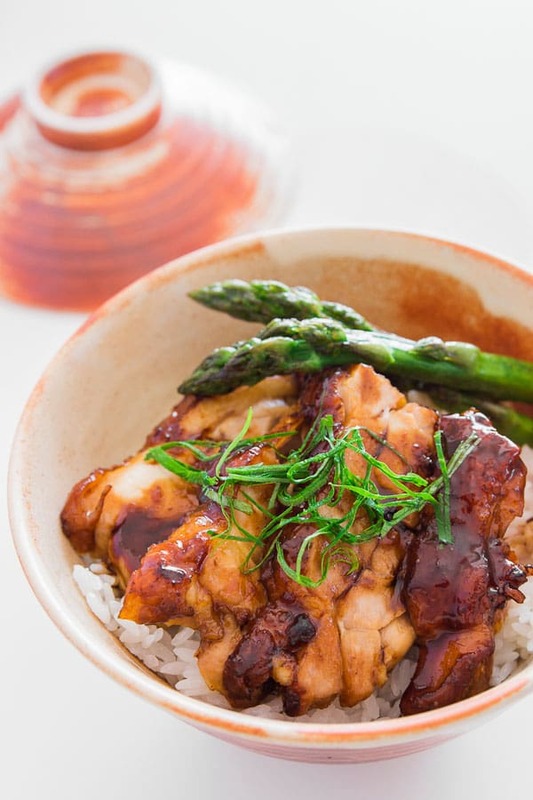 Authentic chicken teriyaki (鳥照り焼き) comes together in just 10 minutes and is glazed with a shiny, flavorful sauce that's made from a handful of ingredients. Skip the bottled sauce with my version of this classic Japanese Chicken Teriyaki. If you’ve been following this blog for long, you probably remember that I’ve posted about chicken teriyaki before. It was a grilled preparation that involved brining, grilling and basting the chicken, and while delicious, it’s a fair amount of work. 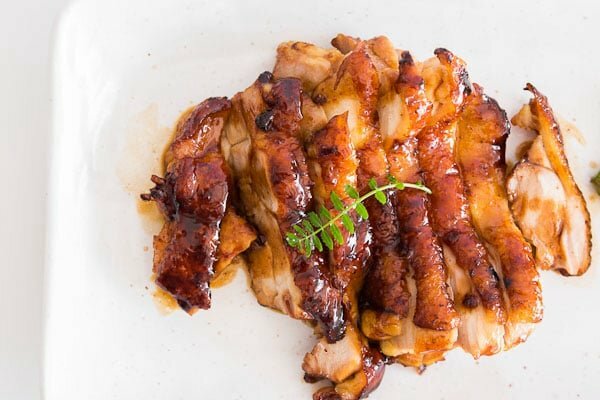 While teriyaki may have originally been a grilled dish, these days in Japan, the chicken is pan-fried more often than not due to busy schedules and a lack of charcoal grills. It doesn’t have the smoky flavor that grilled chicken teriyaki has, but pan frying produces chicken that’s more moist and tender. 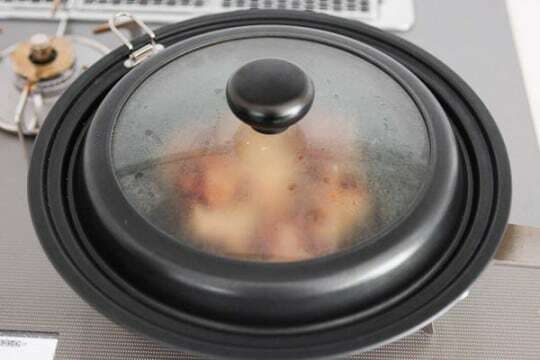 The best part is that the chicken and sauce can be made in the same pan, which not only makes it fast and easy, it means there’s one less pot to wash. Since discovering this method for easy chicken teriyaki, I’ve honestly been using it more than the grilled method because it produces great results with much less effort, and so I wanted to share it with all of you. In case you’re wondering why there’s no cornstarch in the sauce, it’s because the soy sauce and sugar caramelize during cooking, naturally thickening the sauce. If you add cornstarch it not only clouds the sauce, your teriyaki sauce will taste flat in comparison because it hasn’t had a chance to caramelize. This can be made with any cut of chicken, but in Japan the thigh meat is preferred because it has more flavor. 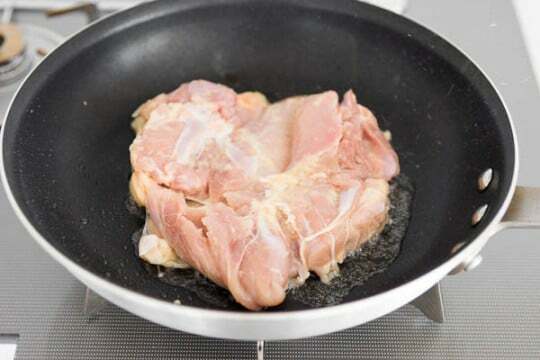 In Japan, “chicken thighs” include both the meat from the drumstick and thigh, so one “thigh” ends up making for a large steak-sized fillet of chicken. In the US, you can either buy whole legs and fillet them yourself, or you can just use more of the smaller chicken thighs. Either way, make sure the fillet is as even in thickness as possible otherwise you’ll end up with parts that are undercooked and other parts that are overcooked. Rub the ginger and and salt into the chicken and let this sit for at least 30 minutes. 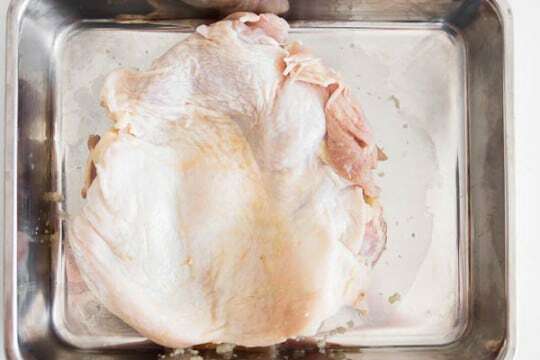 After it's marinated, use paper towels to dry the chicken as best you can, removing any excess ginger pulp. Heat the oil in a heavy bottomed frying pan over medium heat. You don't want to start the chicken off over too high a heat otherwise it will not cook through before burning. 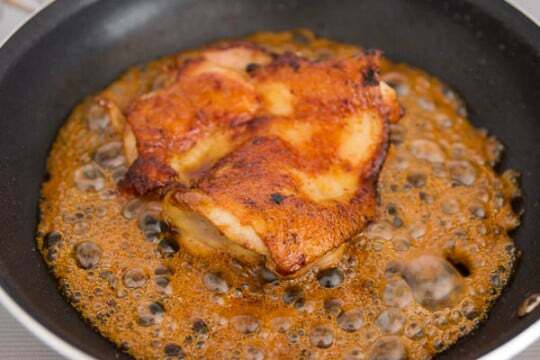 Place the chicken skin-side down in the pan and fry until golden brown on one side. Flip the chicken, then add 1 tablespoon of sake and quickly cover the pan with a lid. Steam the chicken until it is just cooked through (about 5 minutes). Prepare the teriyaki sauce by mixing 1 tablespoon each of: honey, mirin, sake, and soy sauce. Stir to combine. Remove the lid, and drain any remaining liquid and oil. 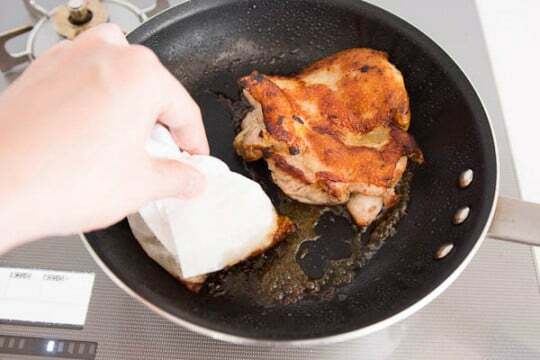 Use a paper towel to sop up any excess oil. Turn up the heat to high, then add the teriyaki sauce. Let this mixture boil, while flipping the chicken repeatedly to coat evenly. 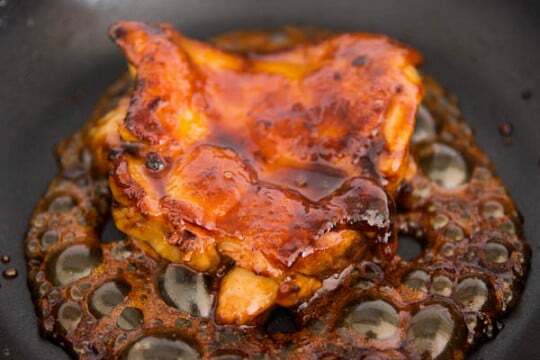 The chicken teriyaki is done when most of the liquid has evaporated and the sauce forms a thick glaze around the chicken. Slice and pour the remaining teriyaki sauce over the chicken. Does this recipe actually call for 2 tablespoons sake then? The recipe calls for one, but you have me add it in twice (once with the lidded chicken and one mixed in to the sauce). Thanks for the suggestion. The trouble is the platform I use only has a limited amount of space after the ingredient for notes. In this case it would have worked, but sometimes I need the space for other instructions. If I’m going to break with traditional recipe writing style I at least wanted to be consistent about it. Also, I figure that listing it twice for two steps shouldn’t make someone mess up the recipe, while only listing it once and having someone accidentally add too much of an ingredient certainly would. Yep, I’ve done that before + I read too fast. Your style is a great teaching method. The 1st time I came across what I thought was a misprint (ingredient listed twice), I slowly read the recipe again & understood. Listing it twice saved the meal & my day, thank you! Is Kikkoman shoyu your preferred soy sauce? It was the brand my mother always kept in her pantry. That looks both easy and amazingly tasty – I’ll definitely be trying it! Yep, absolutely. I’ve spent some time in various ryotei kitchens in Japan, and they almost all use plain old Kikkoman, not some fancy small batch brand as you might expect. What about my high blood pressure which directly increasing with concentration of sodium in my diet? Are you trying to kill me? Why can’t I just eliminate the soy sauce by adding some balsamic vinegar? If I do, can still call it Chicken Teriyaki? looks like perfection, even in such a short time! DELICIOUS and makes my mouth water for more! Easy to follow instructions and terrific step-by-step photos. I followed the recipe to a T, and it looks just like your photo. I’m so glad I found your site. Can you substitute rice wine vinegar for the sake? I don’t think we’d ever need a whole bottle of sake. Thanks! Recipe looks great very much want to try it! Hey Mark, what brand of Mirin do you recommend? I’ve heard things like Kikkoman Aji-Mirin is not really Mirin, I see some MIrin with added sugar etc. Quite frankly I’m lost when it comes to Mirin. Thank you Mark. I’m in Dallas, Texas and I have looked around, the closest I have found without additives is Eden Foods Mirin from whole Foods. Most of the Asian markets here stock Aji-Mirin. If you go to Japanese grocery they should sell little 350ml bottles of sake. Yep if you keep it in the fridge it will last indefinitely. It will start taking on different flavors as it ages (kind of like whiskey), so it might not be good for drinking, but it will be fine for cooking. There are two online grocery stores that sell Japanese ingredients in the US, Mitsuwa and Marukai, they both have a selection of mirins, but unfortunately they don’t list the ingredients online. One way to get a pretty good idea of whether it’s real mirin or not is by the price as real mirin is aged and costs a lot more to make than the fake stuff. While real mirin definitely makes things taste better in this particular recipe, you may not notice a huge difference because the soy sauce is pretty intense. You can buy low sodium soy sauce, I had high blood pressure when pregnant and used it then. Love all your recipe. You are making it so simple to cook it. THANK YOU for sharing itwith us. teriyaki chicken since we lived in Phoenix,AZ. and that was 20 years ago,just got my first computer,only on line 2 weeks and I found you! thank you Marc for your respond. I will buy the sake then, as I want to try all of your other recipes as well. In regards to the meat problem, yeah you were right Marc. I bought the frozen one and sometimes defrosted it for too long before start to cook it. Could you please give me the guidance then? Thank you again & I will definitely try to make it. thank you for your advise and helpful feedback, am so lucky to have found your site accidentally and I will definitely try your other delicious recipe as well. You are ridiculously emphatic about people attempting to kill you on a food blog. Get a life! This is the best recipe ever! So easy to make and absolutely scrumptious! Thank you. Then Dont cook it Or Just Use Balsamic Vinegar……. The alcohol in the sake burns off during cooking so there should not be any alcohol in the finished sauce. You can substitute water for the sake if necessary, but it will not have the same taste. I substituted honey with regular sugar and my sauce was still runny even all the liquid has almost evaporated. What am I doing wrong? I added equal parts of water with soy sauce to reduce the saltiness. Could this be the reason why? Did you substitute water for the sake or another liquid or did you add extra water on top of the liquids called for in the recipe? If you added extra water, that’s most likely the cause. Otherwise, you just need to boil off more liquid, there should only be a few drops of sticky sauce clinging to the pan when this is done. Thanks for the reply! I used sake in place of mirin since I don’t have it. But yeah I did add a couple of tablespoons of water to reduce the saltiness. It was a tad too salty for my palette. So the problem lies with the extra water? Not because I replaced honey with plain sugar?